Catholic nuns in the US have a rich history of protest, challenging everything from the spread of nuclear weapons to racial segregation. Now an order called the “Adorers of the Blood of Christ,” is keeping this tradition alive with a protest against a planned natural gas pipeline that’s set to travel through their land in Columbia, Pennsylvania. 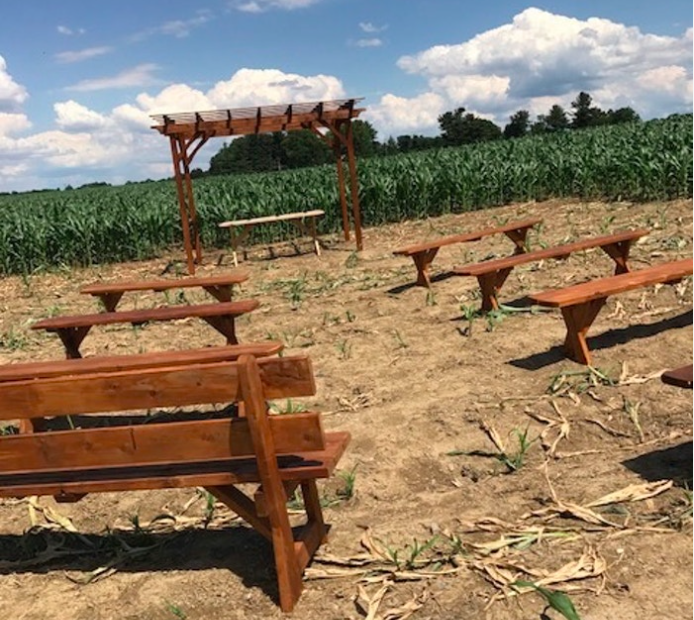 To thwart construction of the The Atlantic Sunrise pipeline and buy more time for legal challenges, the nuns have built a chapel on land that Williams Cos., an Oklahoma-based energy company, has seized from the nuns through eminent domain. The chapel is a small open-air structure with eight wooden benches, an arbor, and a pulpit. The chapel is more a symbolic gesture than anything, the nuns told the Washington Post,notunlike the makeshift camps set up by Standing Rock protesters to challenge the Dakota Access Pipeline in North Dakota. But the chapel makes their resistance known and rallies communities support. The real drama of the protest will play out in the courts. Last week, the Adorers sued the Federal Energy Regulatory Commission along with Lancaster Against Pipelines, a local anti-fracking organization. They argued that FERC violated their religious freedom, under the Religious Freedom Restoration Act, by granting Williams Cos. eminent domain of their land after the company failed to persuade the landowners to let them go through with the pipeline. Eminent domain is generally used when the government seizes private land for public projects such as roads, but private entities can also request eminent domain for private projects. In this case, since an energy source is at stake, FERC decided the case and ruled in the company’s favor. The Religious Freedom Restoration Act, meanwhile, is meant to shield religious groups from overly burdensome regulations or requirements. It was invoked by lawyers working for Hobby Lobby, in the landmark Supreme Court case concluding that private companies do not have to provide contraceptives to employees if it goes against the owners’ religious beliefs. The Adorers are bolstering their case with another law, the Religious Use and Institutionalized Persons Act of 2000, which seeks to shield religious groups from land-use laws that violate their religious beliefs. If they win the case, it could set an important precedent throughout the country, making it considerably harder for eminent domain to be invoked, and giving religious groups another legal tool, according to legal analysts who spoke with the Post. The nuns ardently believe in protecting and promoting the environment. In fact, the Adorers enshrined the principle of “land ethic” in their code of conduct in 2005, an idea that the environment is sacred and should be protected from harm. Since then, the nuns have joined protests in Brazil to challenge hydroelectric dams and protests in Guatemala to protest gold mines. The natural gas pipeline is another project that they consider destructive because of the potential for leaks and, more fundamentally, because it enables the use of fossil fuels which accelerate climate change. “This just goes totally against everything we believe in — we believe in sustenance of all creation,” Linda Fischer, a sister in the order, told the Washington Post. Williams Cos., meanwhile, sees the pipeline as a way to bring the state’s booming natural gas production to a wider market. They’ve tried to work with the nuns and other landowners who are holding out by changing the route of the pipeline, promising to return the land once the pipeline is built, and conducting environmental integrity surveys, according to the Post. But when that failed, they turned to the courts for eminent domain. And once the protests and court challenges started, the company asked for an emergency injunction to clear the new obstacles. 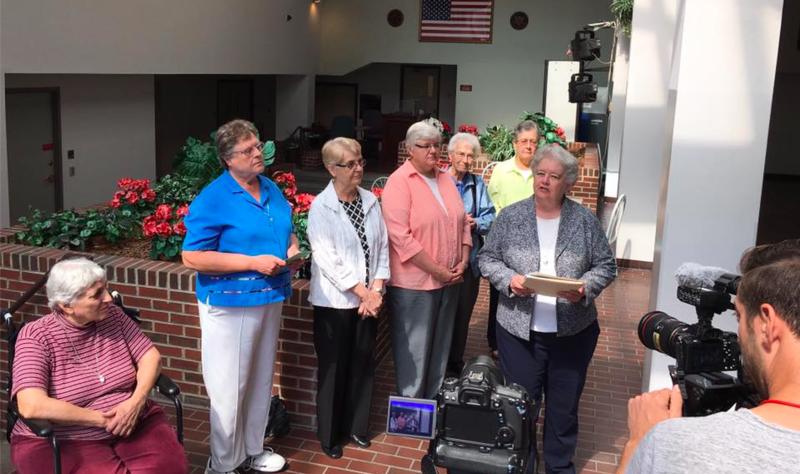 A judge ruled against them in that ruling, but the legal battle is just beginning. In his 2015 encyclical, Pope Francis called on Catholics to protect the environment. “Every effort to protect and improve our world entails profound changes in lifestyles, models of production and consumption, and the established structures of power which today govern societies,” he wrote at the time. The nuns are taking these words to heart as they plan for a 24/7 vigil at their open air chapel if Williams Cos. goes ahead with construction. 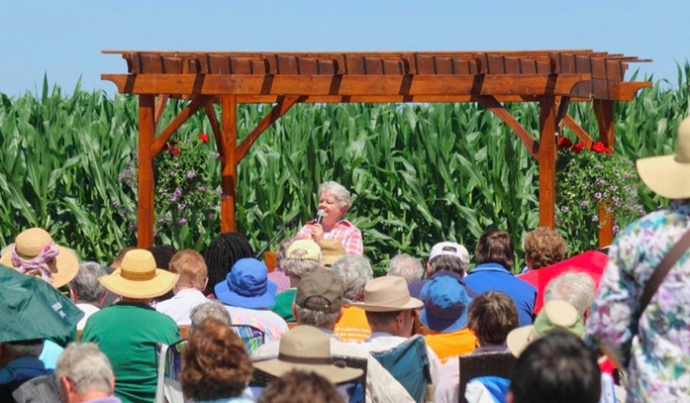 “As religious women of the Catholic Church, our faith impels us to stand up when the principles we hold sacred are compromised on the very land that is ours,” Sister McCann said in her sermon.